A pair of ornate silver-ringed staffs called the "Senior Stick" and the "Lady Stick" were passed every year to student leaders, holders of an office also called the "Senior Stick" and the "Lady Stick." Photo courtesy the S.J. McKee Archives, Brandon University. In 1919-20, all of the societies of Brandon College amalgamated into one students’ association. The Christmas issue of The Quill that year is the first to list the position of President and Senior Stick, although the text indicates the term “senior stick” had been used in previous years around the college. Prior to 1919, the main student executive appears to have been the Literary Society, for which there were elections every year. Presidents of the Lit Society (1910-18) could be either male or female. The position of Lady Stick first appears in 1923-24. For decades, student leaders at Brandon College, now Brandon University (BU), held a symbolic staff that demonstrated the responsibility and honour of their elected positions. 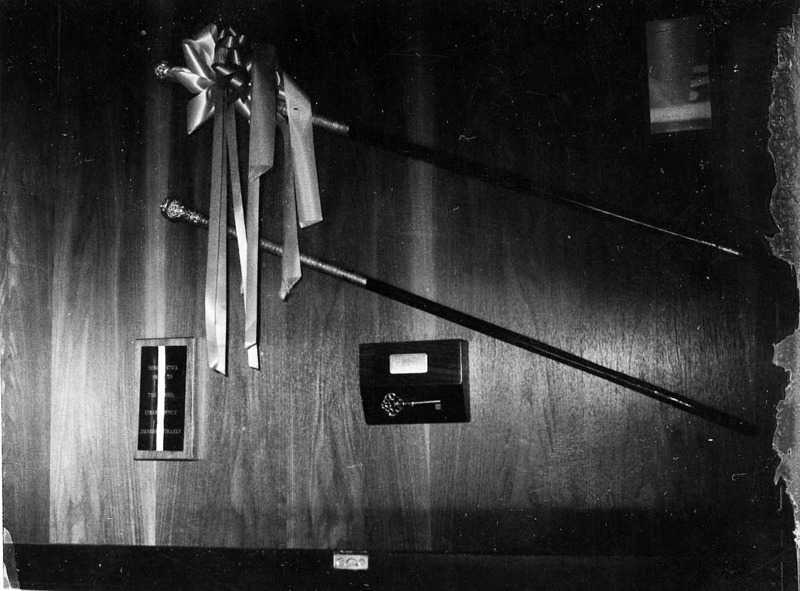 The Senior Stick and Lady Stick were students who served senior roles in the student executive of the college, and although their precise roles and responsibilities changed over time, they were generally seen as student body president and vice-president, working with the heads of other student organizations and class year presidents to help the college’s social and student life run smoothly. The Stick wasn’t just a title, it was also an actual stick. 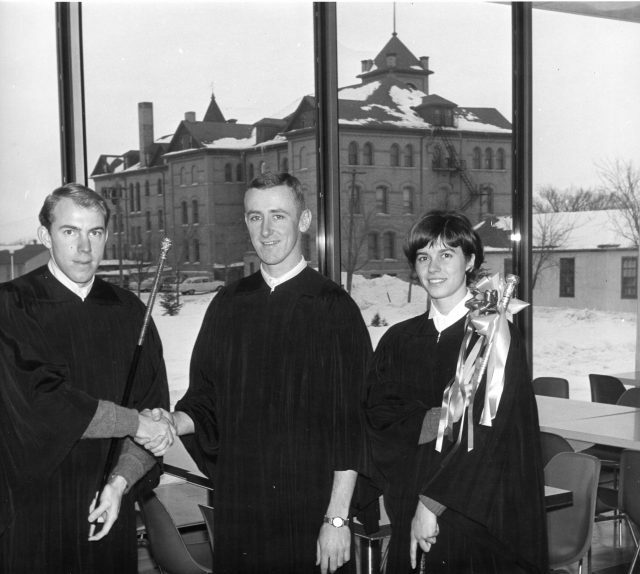 Each year until 1967, when Brandon College became Brandon University, the Senior and Lady Stick were each presented with a solid wooden staff, covered in silver rings that bore the name and year of every previous officeholder. Plot twist: The Senior Stick is missing. The Senior Stick and Lady Stick, on display. Photo courtesy the S.J. McKee Archives, Brandon University. Today, that display case is housed in the McKee Archives at BU, along with the Lady Stick. But the Senior Stick? Nobody knows. Some point to extensive renovations in the mid-1990s as when the Senior Stick may have gone missing, but no one is really sure. Now, a group of dedicated BU alumni, including Taylor, say the best way to get the Senior Stick back is to have a full replica made, complete with names and class years of all the former Senior Sticks engraved on silver rings, just like the original. The drive really started at last year’s Homecoming weekend, Eisler says. Anyone who would like to donate to the replacement of the Senior Stick can call Carla Eisler at 204-727-9697 or donate online at brandonu.ca/give.